Just a quick update after a brief Sunday ski. As you will see from the report below, the early bird most definitely did not get the worm on Saturday so there was little to no motivation to get up early, however when we heard that Shakey Knees was going to open at 11am we headed in that direction, and were incredibly pleasantly surprised – the skiing was great. It is 100% man-made, with virtually no natural snow on the sunny face of the mountain, and while it was only half width the snow quality was consistent and we had a few great runs. After that we headed up to Koflers for lunch, one run on LBS – this was vastly improved from Saturday as I expected the traffic helped pack in and even out the snow. Still very firm in patches. We then had one on Skyline, another on Shakey and called it a day. Beautiful blue skies, skiing on our cheap season passes, we had a great weekend. Next priority for the snowmakers is the Summit area – this will be quite the coup if they can add this to the list of terrain for the school holidays, this year Buller is clearly leading the Victorian resorts in terms of skiable terrain, thanks to the investment in snowmaking, and hard work by the snowmakers! Just got back in from the first Oz session of 2013. A sneaky 15cm on Monday night followed up by some solid cold snowmaking evenings has allowed Buller to pull out the stops and open some runs beyond Bourke St. Holden Express opened to access the Wombat Chair / Little Buller Spur. The new automated guns on Little Buller Spur allowed the older guns to be relocated to Skyline which has been an success and allowed it to open as well. We got out early for first lifts and while it was great to be out on snow, and in the fresh air the snow was…ummmm…interesting. 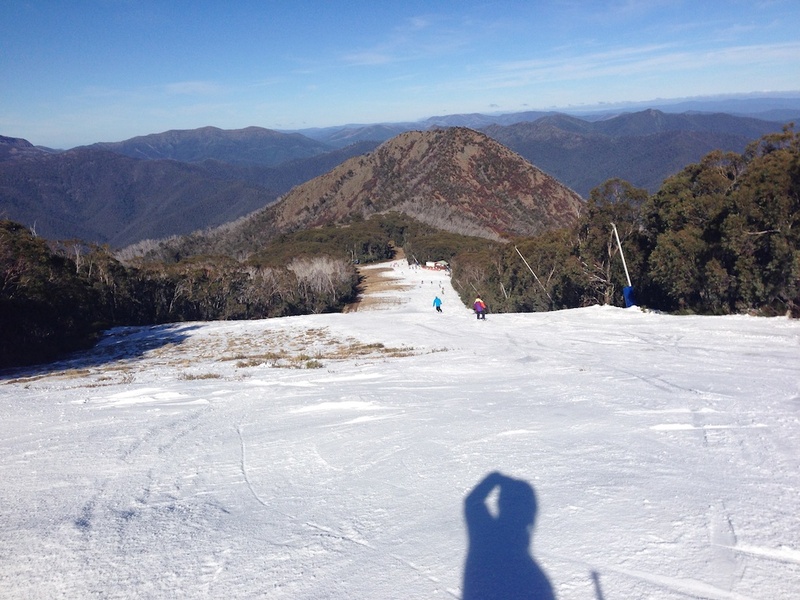 Typical early season conditions, half width, thin in spots, snowmaking-affected with patches of ice on the bottom half, we did a few runs and decided that it would be remedied by warmer temperatures and traffic so we dropped into Koflers for morning tea and a catch-up. When we emerged we did 3 more runs on LBS and it was far better, and I’m sure it will be even better tomorrow after some skier compaction and another night of grooming. But the fact remains that it’s by far the most substantial skiing being offered in Victoria today. After LBS we skied over to Skyline and were very pleasantly surprised, the snow was really nice so we did a few more runs there and then one of Bourke st, calling it quits at about 1pm. Good to get the sliding feeling and the legs moving again!!! It’s pretty funny when you compare today with our previous day skiing in France – but the fact remains that we love skiing in Australia as well and we wouldn’t have it any other way.